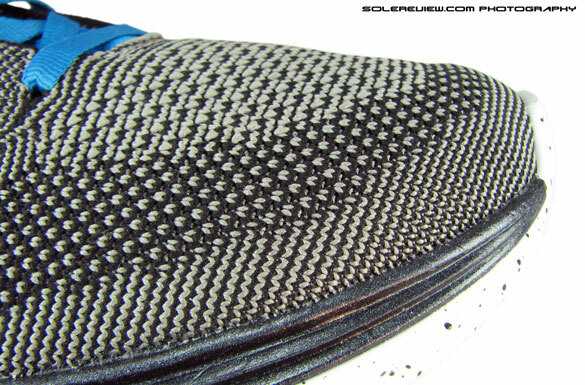 Outsole: Carbon rubber (BRS 1000), injection molded EVA. 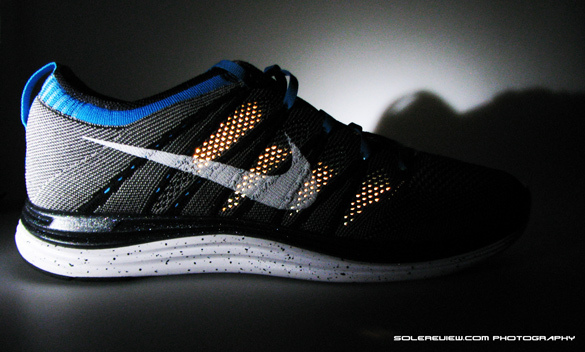 Extension of the 2012 Flyknit Trainer, with better cushioning due to use of Lunar foam. Fits and breathes excellently, in a super lightweight package. One of Nike's best new intros, and the shoe should make most of the runners happy, ranging from heel to forefoot strikers. Also one of the few well cushioned shoes in the market with a low heel to toe drop. There are some areas which can improve, but none of them are deal breakers. Our original plan was to review the 2012 Nike Flyknit Racer or the Trainer. As luck would have it, that plan didn’t turn out so well. Sometime in late November, we went to the Santa Monica Nike store and tried on the Racer and the Trainer, and made the silly mistake of not buying them on the spot. We decided to defer our purchase to the following week, when we would be in Portland, Oregon. Surely, we should have no problem buying the Flyknit in downtown Portland, Nike’s own backyard, right? 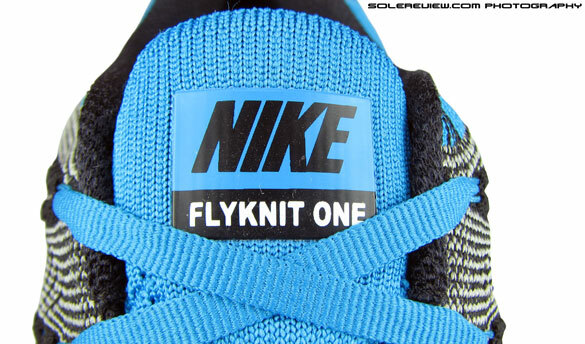 Wrong – all the Flyknits were sold out, and horror of horrors, it was gone online too. We had our chance in Santa Monica, and we blew it. We couldn’t believe it. This kind of buying frenzy is usually reserved for extremely limited edition sneaker releases, and not for race day running shoes. That’s when we realized how hot this shoe was. But fortune favors the brave, and we got the opportunity to review the 2013 Flyknit One+ weeks ahead of its global release. Needless to say, we jumped at it. With all the hype surrounding the Flyknit Lunar 1+, we were expecting a grand box specially designed for the shoe (a la Lebron X), but it arrived in a regular box. We guess all of Nike’s packaging money is dedicated to Baller kicks. The Flyknit platform is a brand new step, not only for Nike, but for the entire athletic footwear industry. 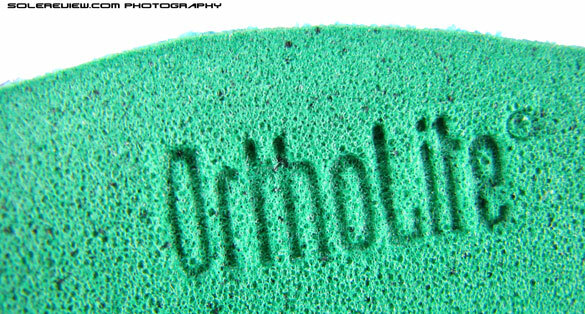 For decades, shoe uppers have been all about several layers of overlays, underlays, mesh, seams and adhesives. Recently, shoe uppers had started using a lot of no-sew technology, but still, that step was evolutionary; not exactly turning footwear manufacturing principles on its head. The Flyknit upper, on the other hand, goes where no other shoe has gone before – get rid of all the layers and overlays, by using a engineered knit upper which promised to result in a precision fit. The whole idea is incredible – so much so that the TIME magazine named the Flyknit Racer as one of the best inventions of 2012. But Nike has a history of coming up with radical ideas for running shoe uppers, so the Flyknit doesn’t really surprise us. Remember the 1986 Nike Sock Racer, the 1995 Footscape and Air Rift? The Flyknit Racer and Trainer were released in Fall 2012, with the Racer being a raceday shoe and the Trainer, which was targeted towards mainstream runners. Nike follows it up in 2013 with the Flyknit Lunar 1+ , which combines the 2012 Flyknit Trainer upper (with some changes) with the popular Lunarlon sole unit. The result? Let’s go over that in our performance review. The 2013 Nike Flyknit One+ takes the upper of the 2012 Trainer, and adds two things – a plusher heel collar area, and ribbon laces. Doesn’t sound like much, but adds a lot of comfort to what was already a great shoe to wear. The Flyknit upper, as we’ve come to realize after putting miles on them, is simply brilliant. If we had to pick one thing in the Flyknit upper which shines through, it is the amazing fit. 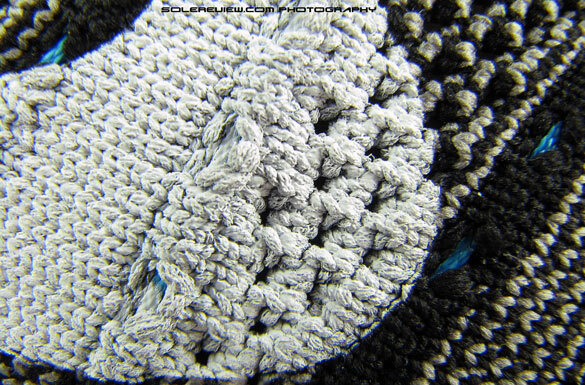 The entire upper is one knit unit, just joined at the heel with a seam. The knit structure varies depending on the upper area. Just the toe area alone has four different knit structures, each with with different stretch properties. The fabric right around the midsole edge is the non-stretchy type, and as you move upwards towards the center of the toe box, the knit property changes to stretch. The spot over the big and small toe is stretchy, and a band (colored in dark grey) runs diagonally across the lower section of the big toe to the arch side. This separates the big and small toes, so while you can more around your toes freely, the tighter band prevents the toe box from bloating upwards. But we noticed that the toe box height was a bit low – in conventional running shoes, there is a some space between the top of the foot and the upper, but in the Flyknit One, you sense the knit fabric pressing down on the toe. Not in an uncomfortable, restricting way, but nevertheless you are bound to feel the difference. 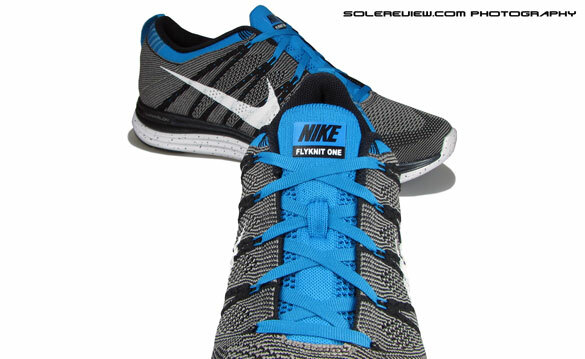 But this sensation diminishes with time, as the Flyknit upper begins to adapt to your foot shape. Move towards the midfoot, and the knit structure changes again. Three different variations allow two-way horizontal stretch, while creating areas for the Flywire loops to run through, and also have an eyelet panel which is inelastic. Ventilation is superb in the midfoot, with the knit section having large pores for the air to pass in and out freely (see our first photograph with the light passing through). 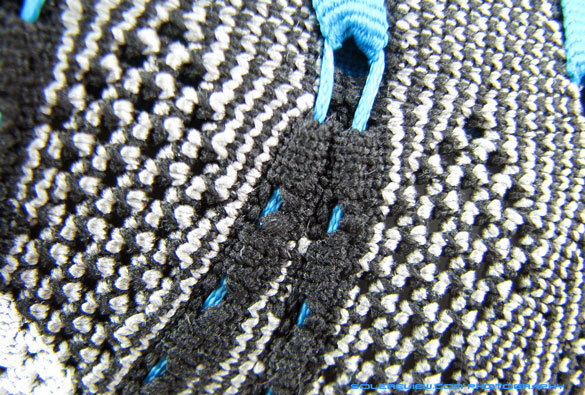 Inverted ‘V” shaped knit bands accommodate the blue Flywire cords, and it does it in way so that the loops are integrated into the upper – this eliminates any pressure which could have resulted from tightening the lace loops. 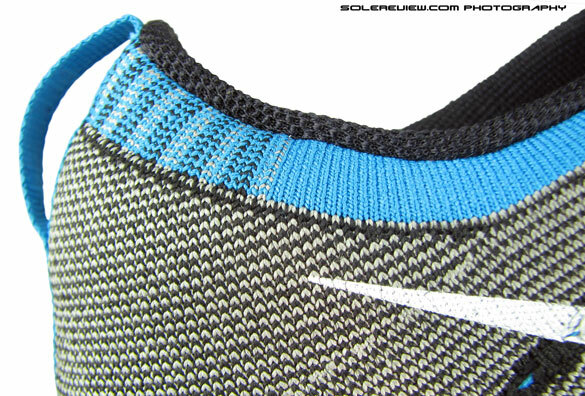 The Swoosh logo is screen printed on the knit upper, and frankly, we think it came across as a bit tacky (see picture above) and out of sync with rest of the design elements. Hopefully, Nike will find a way around it. The rear section has a relatively simpler construction, but it still has a few clever tricks up its sleeves. 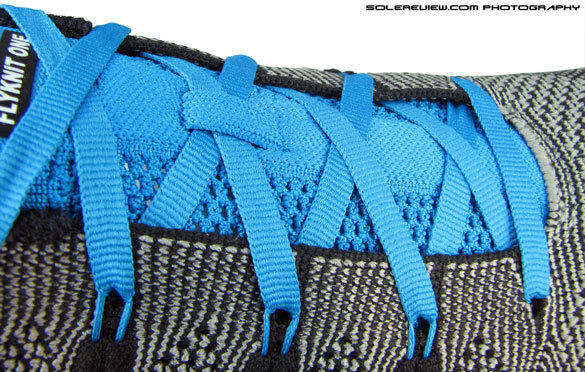 While the majority of the knit fabric wrapping the heel counter is of the non-stretchy type, it morphs into a elastic rib (blue band) right at the collar area. 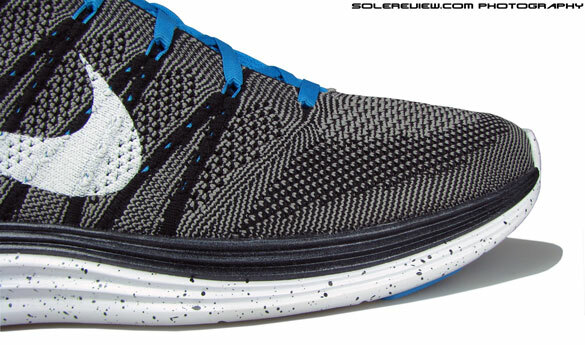 This is where the Flyknit One really shines; the collar grip, aided by the elastic rib panel and the padded collar lining (absent in the 2012 Flyknit Trainer), is purely phenomenal. All the miles we’ve put in on the shoe so far, and the way the shoe wraps around the ankle is parallel to none. The collar fit is also aided by an inclusion of a rather large molded heel counter, and a rather unusual one at that – the counter seems to have two curves, one right at the base and the other which wraps around the Achilles. We will put more miles on this and come back with feedback on this new construction, but for now, we’ll just stop at saying that the heel fit is excellent. The other thing we’d like to call out is the 2013 Flyknit One trainer has also incorporated a proper collar lining with padding and all, so this has really elevated the rearfoot comfort levels when compared to the 2012 Flyknit Trainer. While the Flyknit One isn’t intended as a replacement for the Flyknit Trainer, it just gives runners more choice with regards to the level of comfort they seek in a Flyknit shoe. From what we’ve seen in the recent past, Nike has been stingy with adding reflective elements for night time visibility, and the Flyknit Lunar 1+ is no exception. The only reflective bit is the pull tab on the heel, and that’s that. We’re mystified by why Nike would completely eliminate visible elements in the front. More so in summers, when all the apparel you have is a pair of running shorts and a vest, so reflectivity is a welcome feature. 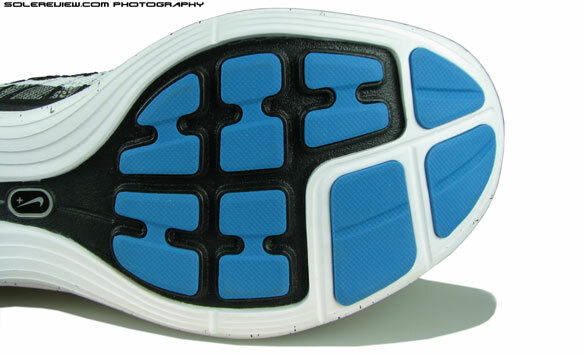 The tongue is a one piece unit, with a padded foam core running along the center, flanked by vented areas. Thin, flat ribbon laces go through the Flywire loops and over the tongue and the laceloop – part of the knit fabric which sits flush with the surface; we observed that the flat ribbon laces performed better when it came to reducing the top down pressure. The foam insert on the tongue centerline also helps to minimize transferring the push down when the shoes are laced tight. 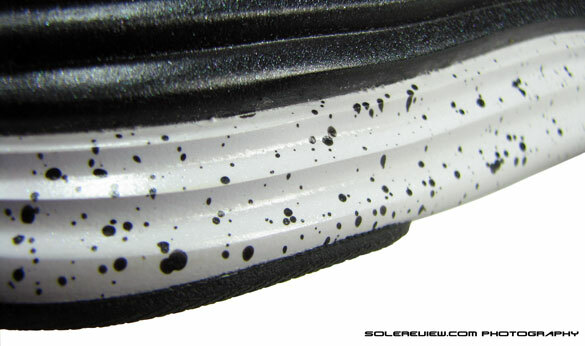 Wise move, this, and an evolution from the regular laces used in the 2012 Racer and the Trainer. 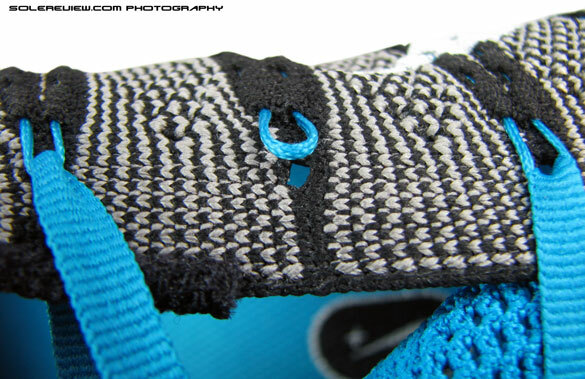 One thing to notice is the absence of the Flywire loops in the first eyelet in the front. This keeps the forefoot free of the constriction experienced in the Lunarglide 4, and the Flywire loops in the rest of the section work perfectly to apply the right level of cinching pressure on the sides. But the tongue isn’t without its shortcomings. After a while, the tongue slides to its side in spite of the lace loop, which we find very annoying in any running shoe. They should have retained the double lace loop from the 2012 Flyknit Racer, and if you ask us, also add a small laceloop on the tongue top (eg. Brooks Ghost 4/5). The tongue slide in running shoes is like the common cold; while medical science can do anything from organ transplant to facial reconstruction, it hasn’t figured a cure for the common cold. 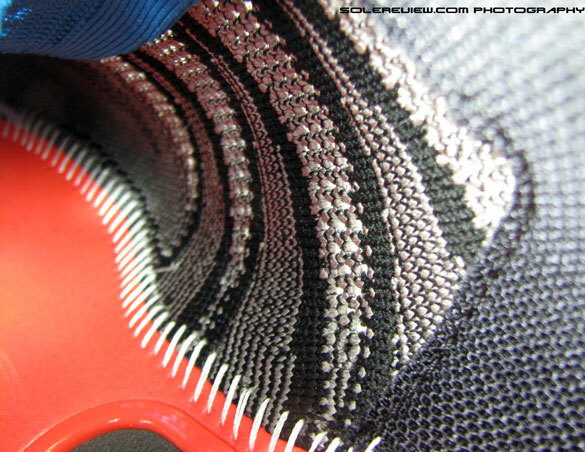 Runners also have to keep a tab on the ribbon lacing in the Flyknit Lunar 1+; when compared to traditional laces, it needs more knot pressure to keep it from coming undone. Once you get them together tight, they stay put. (update 2.26.13) There is flip side to the thinly padded tongue. After breaking in the shoe, when we tried going downhill, we sensed the foot sliding towards the front – much more than in a traditional running shoe. The thin tongue simply does not have the push down grip to keep the foot sliding when running on steep declines. Something you might want to keep in mind. The fit changes as the shoes puts on more miles. Right out of the box, it runs extremely snug and one might think of buying half a size larger. 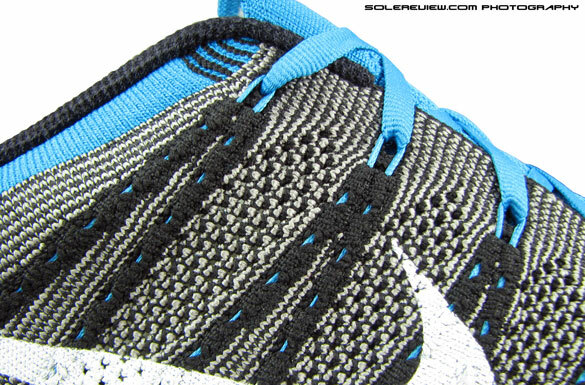 But as days pass, the Flyknit upper tends to expand a bit, freeing a lot of room, especially in the forefoot. So if you really like the straight out of the box fit, we would suggest to go half a size smaller and then wait for the upper to open up a bit after 10 miles or so. The 2013 Flyknit One sole unit is designed ground up, marrying the one piece Flyknit upper with the now proven Lunar platform. This results in a ride which is very, very different from that on the Flyknit Racer and the Trainer. Last year, both the shoes used Zoom air bags in the midsole, and when combined with the waffleskin rubber outsole, translated into a relatively firmer ride. The Flyknit One, on the other hand has a very well padded ride. We wouldn’t say plush or pillowy soft, because it isn’t. 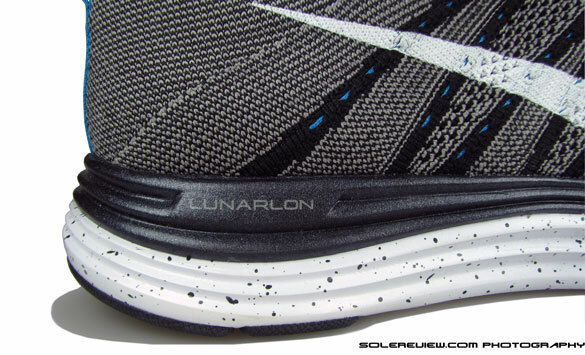 The Lunarlon unit is interlocked with the speckled lower midsole, and up in the forefoot, the rubber outsole pieces are glued on directly onto the Lunarlon foam. So everytime the body weight is on the shoe, that area tends to press inwards, resulting in the padded feeling. Good move, Nike. The midfoot area is also continuous, without any break so the heel to toe transition is seamless, and in the process making the shoe suitable for heel, midfoot and forefoot strikers. What is to be noted that the Flyknit One does not have the dynamic support which has been touted so much in many of the other Lunar series. It is a shoe which is meant for neutral runners looking for a lightweight (262 grams for a Size 11) cushioned ride, and in that sense, the Flyknit One lives true to that promise. Flexibility is not as good as expected, though. This is because of the near complete lack of flex grooves on the midsole periphery, which makes bending the shoe a wee bit tougher. The outsole is abundantly covered with rubber pieces in high wear areas, which makes the Flyknit Lunar 1 adequately durable. 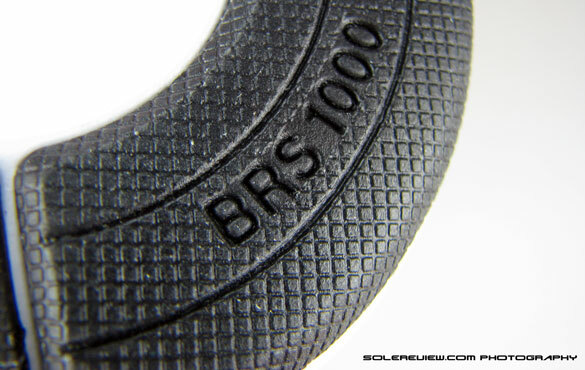 But The tread pattern is not so confidence inspiring – the contact area is very flat, so there might be a grip issue on less than ideal surfaces. We’ll get back to you on this. The two piece midsole set-up would remind you of the Lunarglide 4 construction, but the Flyknit Lunar 1 configuration is different. For starters, the Flywire Lunar 1 does not have the beveled Lunarlon layer, which means this shoe does not have ‘dynamic support’. This is purely a shoe meant for neutral runners or runners with high arch who need ample cushioning. 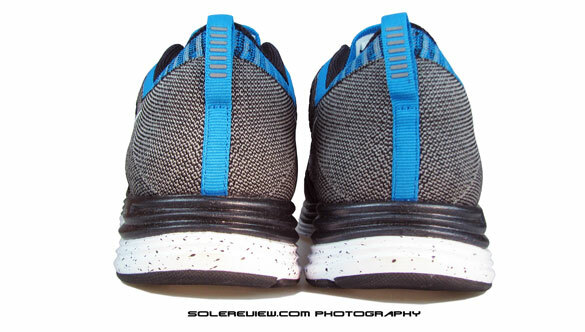 From a design viewpoint, the Flyknit Lunar 1 sole is closer to the way the Nike Dual Fusion sole unit is made. For runners who are transitioning(or planning to) from the 2012 Flyknit Trainer to the Lunar 1, it is important to note that the ride on the Flyknit Lunar 1 is much softer than the Trainer. 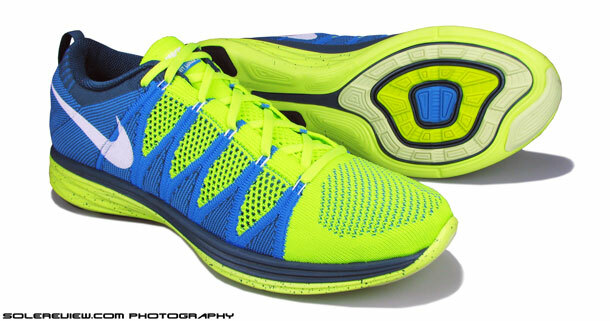 This means that the Lunar 1 will be far less of a tempo shoe when compared to the firm riding Flyknit Trainer. The Flyknit Trainer was more focused as compared to the Lunar 1; the latter is a great shoe for recovery and conditioning runs. The removable sockliner is a thinner, denser version of Ortholite than what is used in most of Nike’s other running shoes (LG4, for example). Goes well with the padded-but-not-plush feel of the sole unit. So there you go. 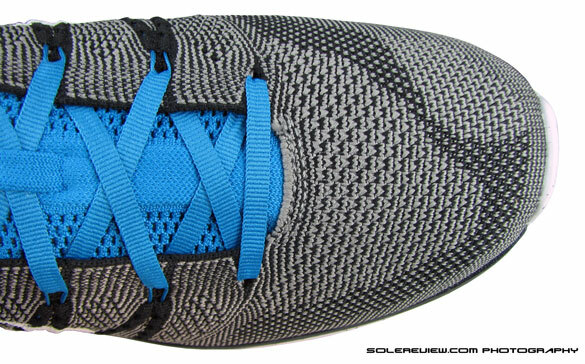 Our initial thoughts on the 2013 Flyknit One Trainer. What you have is a great running shoe which shines in most areas – be it the near perfect upper fit, low weight (262 grams for a size 11, almost 40 grams lighter than the Lunarglide 4) or the incredibly consistent and padded ride. The price is $160, which is as pricey as they come. We gave the shoe 4.5 out of 5, deducting 1/2 point for the tongue slide, average forefoot flexibility and the high price. Update, May 19th 2014: Here’s our review of the 2014 Nike FLyknit Lunar 2. Comes updated with a brand new outsole and no tongue slide! Click on the picture to go to the review.